the application and send the filled application in prescribed format before last date (15/05/2017). Bhagwan MahavirHospital, Delhi hiring eligible candidates for 94 vacancies through written test/ Interview. Date of Interview will be on 25 & 26 & 29-May-2017. Bhagwan Mahavir Hospital Recruitment 2017- Available vacancies, Age details, Salary, Application procedure are given below. Last date for the receipt of Application: 17-05-2017 till 04.00 PM. Date of Announcement of MCQ written test/ Interview on website or Notice board: 24-05-2017. Date of Interview for Sr. Resident posts: 25 & 26-05-2017. Date of Interview for Jr. Resident posts: 29-05-2017. 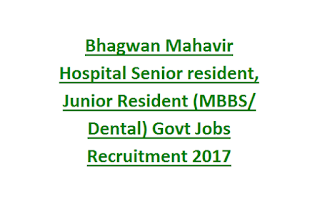 There are total 94 posts are going to fill through Bhagwan Mahavir Hospital Recruitment 2017. Pay Scale for Sr Resident posts is Rs. 67,700/- plus other allowances. Pay Scale for Jr Resident posts is Rs. 56,100/- plus other allowances. Sr. Resident: Candidate must possess MBBS Degree with PG/ Diploma/ DNB in respective specialty from a recognized University/ Institution. Sr Resident (Dental): Candidate must have completed BDS with PG Degree in respective specialty from a recognized University. Jr. Resident (MBBS): Candidate must hold MBBS degree from any recognized University with internship completion certificate. Jr. Resident (Dental): Candidate must have completed BDS degree from any recognized University with internship completion certificate. Sr. Residents: Upper age limit is 33 years for post Graduates and 35 years for post doctoral degree holder. Jr. Residents: Upper age limit for general candidates is 30 years. Age relaxation for SC/ST candidates is 05 years and for OBC candidate is 03 years (belonging to Delhi only). Selection of candidates applying for BMH Recruitment vacancies will be shortlisted based on their skill given in Interview. Interview will be conducted for Sr. Resident posts on 25 & 26/05/2017. Interview will be conducted for Jr. Resident posts on 29/05/2017. Interested/ Eligible candidates are required to bring original certificate and testimonials, 2 passport size photographs on the date of Interview. Download the application from the official website and send the filled application before 17-05-2017. 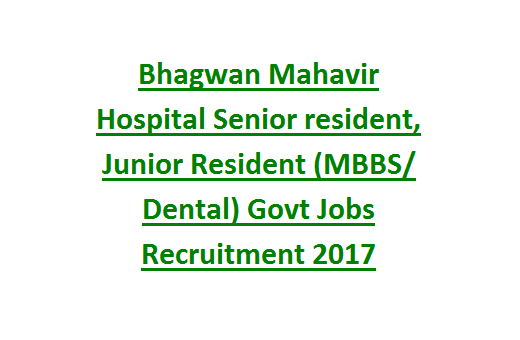 Apply for Bhagwan Mahavir Hospital Recruitment 2017. Click here to see the official notice of BMH Senior Resident, Junior Resident Jobs Recruitment.